Laraine Wallowitz’s research interests include literacy across the curriculum; critical literacy; and gender, class, race, and sexuality. She is the author of the book Critical Literacy as Resistance: Teaching for Social Justice Across the Secondary Curriculum, and her articles have been published in academic journals including English Journal and Iris: A Journal About Women. She has also presented at numerous esteemed research conferences. 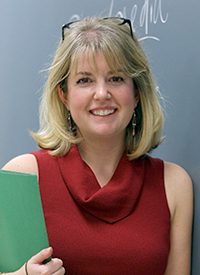 Wallowitz earned her Ph.D. in English Education from the University of Virginia and her M.A. in American Studies from Boston College. She also holds a B.A. in English Teaching from the University of New Hampshire.